Sadly, this will be our last night QRV on Palagruza. Tomorrow in the afternoon we have to pack all things and put down the antennas. We will leave a dipole for tomorrow evening. We are still alive on our island. 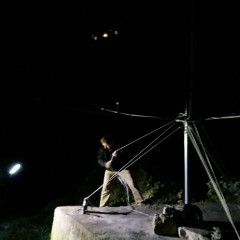 The 2m EME station works now, after Thilo and Heinz repaired the 2m amplifier. There was a damaged capacitor in the reception path, which caused the station being deaf. 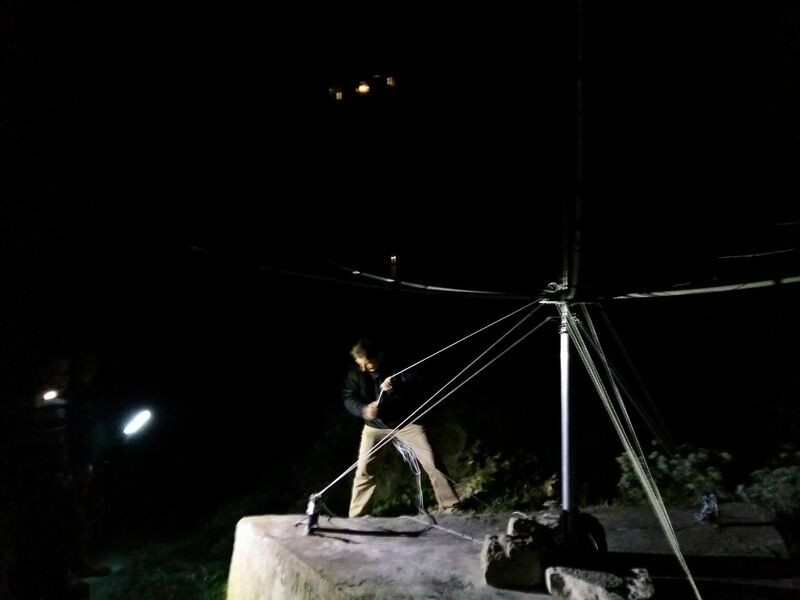 Emir, Mladen, Robert and Anton did a small hike to a nearby radar station, which will scan the sea for boats as Croatia is soon to participate in the Schengen arrangement for open borders within the European Union and Palagruza getting one of the outer borders of the Schengen area. When doing full activity, we have three stations running The propagation could be better, especially on 15m, but maybe it will get better in a few days. The weather is still ok - cloudy without rain. 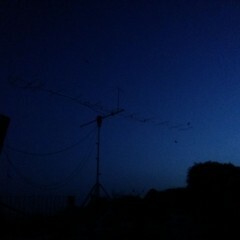 Today in the morning we reassembled our antennas. We have beautiful weather with very slow winds. Our EME station runs, but with some technical issues. The receivers seem to be a bit deaf - maybe there is a problem with a relay in the power amplifier. We will continue trying - until now there is only one EME QSO in the log. An OM from ZL asked, if we will listen for Oceania on EME. We will try it for sure, but we are happy about every EME QSO we can handle. Unfortunately, we have no reliable internet connection, so we can not use ON4KST and other online chats. We had major turbulencies tonight and had to put down and secure our antennas. The hexbeam rotated freely on the mast without any halt, which, of course, tore the coax apart. To prevent damage to the brand new hexbeam itself, we decided to put it down and lock it into its position with cords. Tomorrow we will have to inspect the damages and start repairing the antennas. We hope to be back on the air as soon as possible. 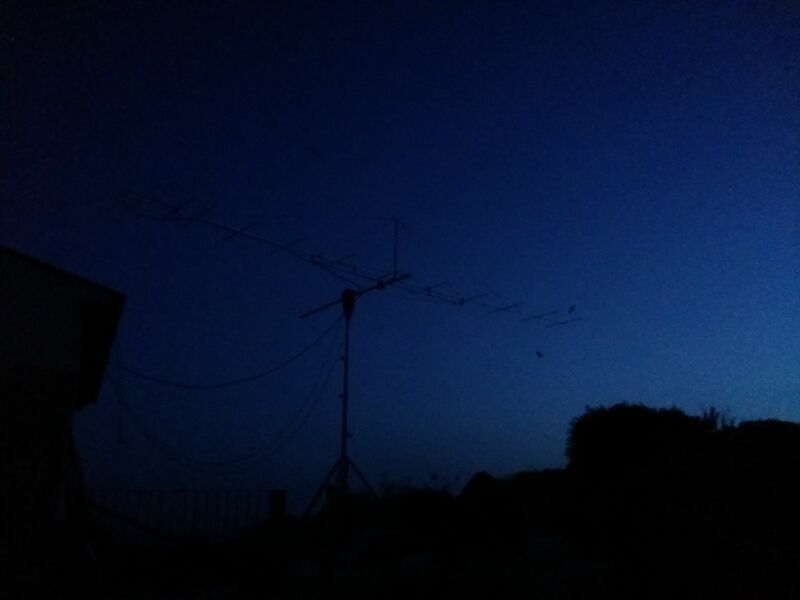 The 40m delta loop and a dipole are the only usable antennas at the moment.